We are a Christ-centered faith community committed to transforming the world­ one disciple at a time. Bishop Ward asks for prayers as leadership teams and the Annual Conference Planning team meet today. 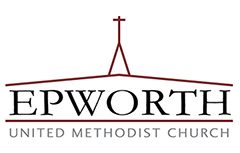 Epworth United Methodist Church declares itself a Reconciling Congregation, seeking to welcome all persons regardless of age, race, ethnicities, disabilities, gender or sexual orientation, into the discipleship of Christian living and proclaim our commitment to seek the reconciliation of all persons to God and to each other through Jesus Christ.